We are loving our new sectional. It can withstand all the craziness of a family with 3 boys and a dog. The only reason I gave it 4 instead of 5 stars is because I feel like the back should be about 6" higher. It is lovely and very comfortable with enough room for our entire family. A definite step up in quality and features over other couches. The recliners are a real space saver and do not require lots of empty space behind them to recline. I upgraded from a 3 seat sofa to this sectional and I do not regret it for a second. The cushions are extremely comfortable and the recliners make it even better. I love the added storage section with the cup holders. Very sturdy, well built couch. It's also super easy to take the pieces apart and move them around if you want to change the layout of the couch. I knew exactly what I wanted and the entire experience was fantastic. This is an amazing sectional. My family loves it and at the price it is hard to beat. I was even checked out on a tablet which was really convenient and was able to get 0% financing. Couldn’t have went any better. Great piece of furniture, great price and super easy. This is a very good buy. It is very comfortable and the color makes it easy to obtain colorful accessories. This is a spacious and solid piece of furniture that lights up the room. Sturdy and firm to sit on is ideal for individuals with back pain. I can not say enough great things about this couch. This sectional is everything you are looking for and more! It is so comfortable and spacious. We absolutely love it and could not be more satisfied. We dont know how we ever lived without it!! The recliners are a total game changer, they are so comfortable along with the rest of the couch. Also love that Raymour and Flanigan offers the option of the 5 year protection plan it really gives you peace of mind. Also the buying process and delivery were super fast easy and efficient! Super satisfied consumers here! seemed like a great sale, all went well. Couch is large enough for the whole family, recliners seem to be a little bit short when reclined. I'm loving my new sectional, great price, easy delivery and installation, and I like that I can change around the pieces, to give it a different look in my living room. Very comfortable and the quality is exceptional. It’s a nice couch. It’s built very sturdy. I like the recliners and storage. Nice color. Fits many people. Can the armless chair sections be put together in order to make a short side with the powered right arm facing chair, cup/storage section, corner section, two armless chairs, then the lefts arm facing section? BEST ANSWER: We are happy to assist you in purchasing the configuration that will meet your needs. Please contact Online Sales for assistance at 866-383-4484, option 3. You can configure the chair basically however you want. How long are the power cords for each power recliner? BEST ANSWER: Hi Chris - They are approximately 6' long. 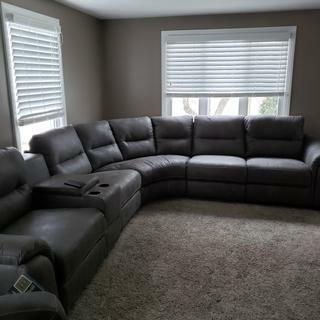 Will this sectional pass through a 32inch doorway? BEST ANSWER: Yes. The backs are also removable so there should be no problem fitting these pieces through a 32" door width. 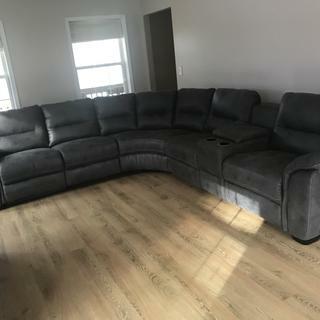 Does couch come with the storage on the other side? Can I buy the storage section by itself? I have this set and the storage section was damaged. BEST ANSWER: For assistance with replacement or damages, please contact our customer care department at 866-383-4484, option 2. Is there a chaise option with this sofa? BEST ANSWER: The Rockland Sectional does include an armless recliner and a large corner wedge but does not include a chaise. Doorway is 29" will this fit? BEST ANSWER: Yes, this should fit through your doorway, though every situation is different.